Image caption Police said the gas pipe fed through the mosque window was "clearly visible"
Four teenagers have been arrested after a gas pipe was put into a Stoke-on-Trent mosque in an attempt to set light to the building, police said. The incident is being treated by police as a deliberate racist attack. Officers were called to Regent Road at 0630 GMT after live CCTV footage showed smoke emerging from inside the building. Three males aged 16, 18 and 19, and an 18-year-old female remain in custody. All are from the local area. A Staffordshire Police spokeswoman said there was no structural damage, but the fire was being treated as a case of criminal damage. 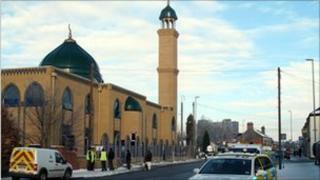 Police said the attackers fed a gas pipe from a nearby building through a mosque window. Ch Insp Wayne Jones said: "It's clearly visible for people to see. "A gas meter on an external wall has been interfered with. That's gone into the mosque and the damage could have been significant. "At this stage we are treating this incident as a racist attack on a religious building. "I am sure the community are as appalled as we are at this behaviour." Stoke-on-Trent CID are examining the scene and CCTV footage of the area.